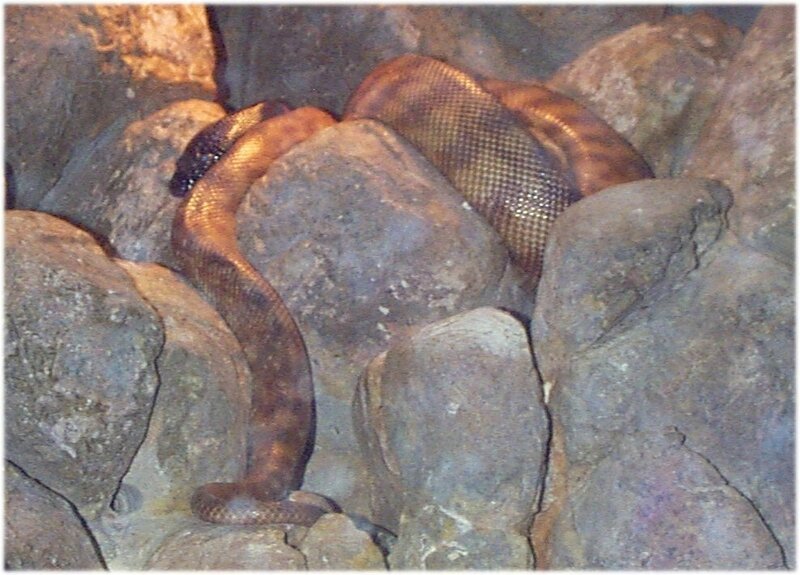 Blackheaded Pythons have dramatic coloration, with dark brown or reddish brown bands against ground colors from cream to tan, and a black head. Apart from the head, pigmentation is darkest in the mid-dorsal region. Females are generally larger than males and can reach lengths of ten feet. All pythons are members of the family Boidae. The black-headed python is in the genus Aspidites, meaning "shield bearer" because the head scales are enlarged symmetrical plates. 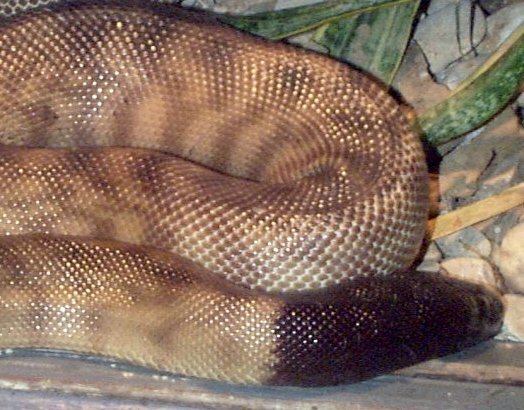 The other member of the species is the woma, Aspidites ramsayi. Both species lack the heat sensing pits on the upper lip that are typical of pythons. The specific epithet "melanocephalus" translates to "black-headed" for obvious reasons. The head is narrow, and barely distinguishable from the neck. Their small black eyes are difficult to see against the head coloration. The nose is rounded and used for digging the burrows in which the animals often live. There are four genera of pythons in Australia. Only the genus Aspidites is restricted to the mainland. 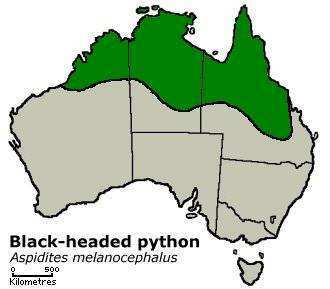 The black-headed python is found in the northern third of the mainland, although not in the more arid regions, where the woma is found instead. Throughout their range they are fairly common. They occupy a variety of habitats: rocky outcrops, hollow logs beside water courses, burrows, or clumps of grass. They are capable climbers, but usually do not. They are nocturnal during the warn season, but in the cooler months are more active during the day. Humans and dingoes are their main threat. Death in the wild is usually by starvation when food is scarce or due to internal parasites. They feed on mostly on reptiles, including monitor lizards, and frogs, along with small mammals and birds. 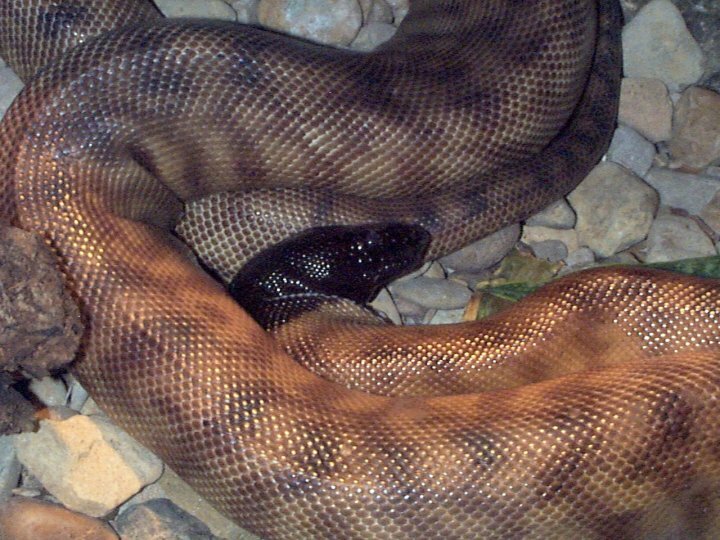 The desert death adder and other elapids are prominent food item for black-headed pythons. Cannibalism has also been reported both in wild and in captive populations. Because of this tendency, captive animals are best housed apart from other species of snakes. They rarely bite, preferring to move away from disturbances, or if cornered, will hiss. Before breeding, males may engage in combat displays, and may bite each other. Like other pythons, the females are egg-layers, producing 5-10 eggs in a clutch. 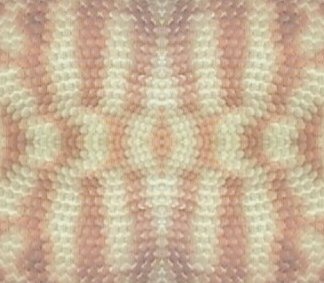 During the incubation of the eggs, she may bask more frequently. The young mature slowly, taking 4-5 ears to reach sexual maturity. Why are their heads black? 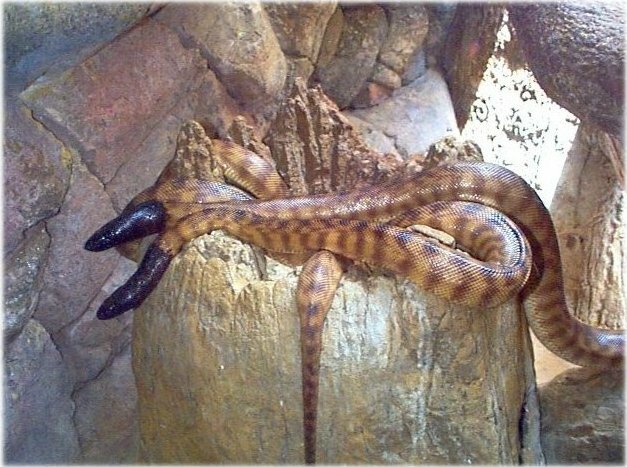 These are burrowing snakes that are often seen with most of the body hidden and only the head sticking out. The black color may absorb heat, allowing them to increase body temperature without exposing the whole body surface. It may also help to camouflage the snake when it is watching for potential prey. I have learned about how magnificent snakes are by making this webpage. I was able to look up other interesting sites and learn how to make a webpage. It was fun and exciting!